Leather is made by chemically treating animal skins, or hides, in a process known as tanning. This process preserves the hides, which can then be used for a number of manufacturing purposes including the fabrication of shoes, garments and upholstered furniture. A wide range of hides can be used to make leather, ranging from the commonplace to the exotic. Cowhide is the most commonly used hide for making leather products. The Satra Technology Centre states that 64 percent of all leather available in the world each year is made from cow hides. Cowhide leather is used to manufacture many products, particularly clothing and upholstered items. Sheepskin leather is used for items such as jackets and rugs. The wool can be left on, making sheepskin leather items particularly warm. 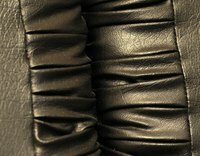 Lambskin is also used for making soft and luxurious leather items such as gloves and coats. Pigskin is often used for jackets, sportswear and saddle seats. Pigskin has a very smooth finish and can be used to make suede leather. According to the Dockers website, kidskin is a lightweight, soft, strong and porous type of leather. This goat hide leather is used primarily in the production of clothing and shoes. Buffalo hide is thick and strong but has the same softness associated with cowhide leather. Like cowhide leather, it can be used for a wide range of products. Due to its durability, it is ideal for shoes and jackets. The hides of deer and elk have been used by Native Americans for centuries. Deerskin leather is soft and smooth but lacks the strength of cowhide. Elk hide leather is soft and strong but is now quite rare. Alligator and crocodile hides are rare and therefore expensive. They are used to make luxury and designer leather items such as boots, handbags and purses. Snakeskin leather is known for its beauty rather than its strength. It is thin and very flexible, making it ideal for accessories. Ostrich leather is attractive, soft, strong and expensive. It is used in designer products ranging from small accessories to upholstered furniture. Zebra hide is another exotic and expensive animal skin. Zebra skin leather is commonly used for furniture upholstery, accessories and bags. Fish skins can also be used to make leather. Sharkskin leather is soft, sleek and durable but very expensive. According to the Sadhana Tanning Co. website, stingray skin has been used to make leather products in Japan for centuries. It is now used by some designer labels in the production of fashion accessories such as handbags. Like sharkskin, stingray leather is expensive. Make a new skinny tie for an affordable, thoughtful and stylish gift for those dapper dads in your life.